We have a second home and have decided to use a beach theme. We love this comforter and the matching euro shams that we purchased. We also ordered the matching shower curtain. It is like walking into a resort. You just can't beat Tommy Bahama. This is the second TB comforter set I've purchased (I allow dogs on the bed so they get dingy after a while). The colors are true to the photo and the comforter is large and covers the king size bed, which has a 4 inch memory foam pad on it, so it is even higher, very adequately. Very warm and cozy.... no need for a blanket. Love the garden look. I was rather disappointed in this set, given it was pricey. On the plus side, the colours are very nice and complement the Mission style queen bed set we have. The downside?...the details say it is machine washable. Well, yes, BUT, WHO has a washing machine drum large enough to handle the oversized proportions of this comforter...soooo, in order to get the "sizing" out of the comforter before its first use, I took it to a professional dry cleaners that I have known for a number of years and fully trust. He washes comforters all the time and uses oversized drums for such a large item. This item was very wrinkled when I picked it up and two weeks after the fact, it is still very wrinkled. I had hoped it would relax and the wrinkles would come out; not so. As well, the sham that covers the box spring is just as wrinkled. The sham really needs to be a good 8-12 inches longer so it nearly touches the floor. It's present size is actually hidden by the comforter that falls amply on either side of the queen bed. So, all things considered, I gave it a 3. We are very pleased with this Tommy Bahama Palmiers Comforter-the colors are very vibrant and tropical and the comforter is well made. We are very happy with this purchase-gave our Florida bedroom the style we were looking for! The Toy Bahama Palmiers 4-Peice Comforter set is very nice and comfortable. I thought the comforter might be more white, but it’s more of an ivory or cream color than I initially thought it would be but still looks great. Beautiful comforter set! The colors were perfect for our bedroom and the matching shams and coordinating platform bedskirt was a huge plus. So many other comforters are too narrow and make the bed look skimpy and unfinished, but this one was extra wide and looks great. The price was also reasonable. Would definitely recommend. Love this look! Gives you the feel of the Caribbean all year long🌴🌞🏝. It is made with a smooth and comfortable fabric-sometimes beautiful comforters aren’t that comfortable but this one is. It is not too heavy but very warm. It really looks great in my tropical themed bedroom! We're really pleased with our purchase of the Tommy Bahama comforter this is actually our third Tommy Bahama set. Couldn't be happier. The quality is truly superior to others we've tried. Would certainly recommend it to anyone. 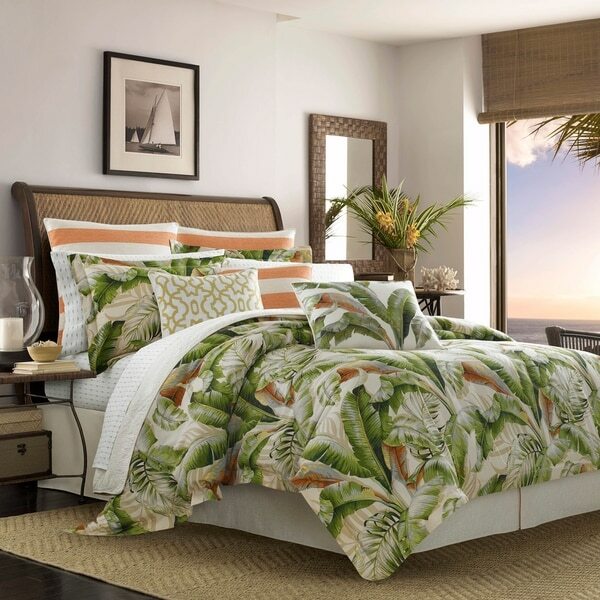 we had looked at and ordered various comforter sets along the tropical theme only to return them ..this comforter set was exactly what we were looking for ...pic was true to color and quality is excellent.. I love it. It's absolutely beautiful. The colors are way better in person. Beautiful and the best price. Nice quality! Well worth the price! "Hello can you please tell me if this comforter set has coordinating throw pillows that I can purchase for it thank you"
"The color choices say Green or Green /Ivory. Which one is shown in the photos? " We like Tommy Bahama product's, have had several of these products in recent years and have enjoyed them. Loved the colors. It got good reviews regarding quality. In one of the pictures of the spread, the pillows in the back were orange stripe around the edge. Do you have any that I can add to my set!? "I am trying to find matching curtains to the Tommy Bahamas Palminiers comforter Set"